I will come up with some subject headings for this later. Anyway, thanks to everyone who wished me a happy birthday. 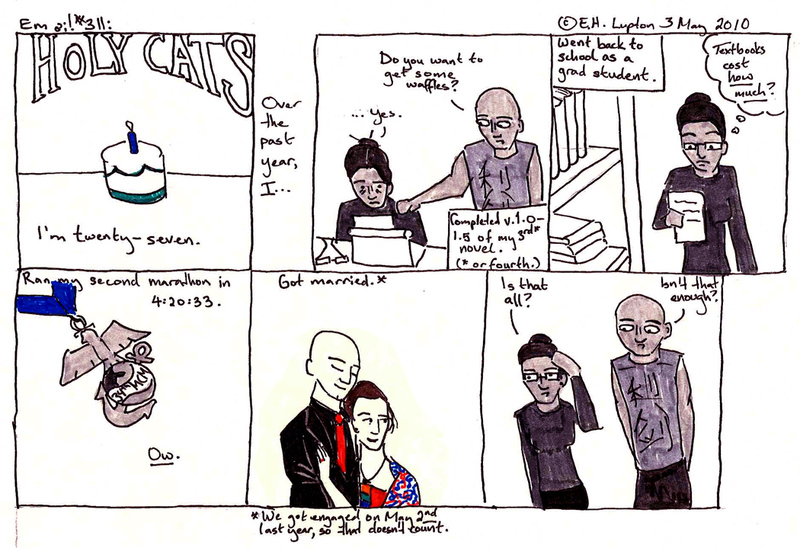 Birthdays in art — Comic books, strips, etc. So I rechecked the Cutter Sandborn Tables – that’s the device librarians use to generate that letter-plus-three-digits number at the end of a Dewey number? For some reason, I’d taken to using L866, which is what my last name (Lupton) would cutter out to using the LC Cutter table. But the Cutter Sandborn Tables, which are the ones you’re supposed to use for Dewey, say Lupt = 966. So there we go – I am corrected. I apologize for any problems this may have caused. Next Next post: Em oi! #312: Cow’s THAT Strike You?